I’m interested in living at the Menno Simons Centre. How do I apply? More information about how to apply and the deadlines are located on our apply to live here page. Why is the Menno Simons Centre named after Menno Simons? The Centre was named after Menno Simons, the founder of the Mennonite heritage in the Christian faith, in recognition of its purpose to nurture Christian community and practice from an Anabaptist perspective. What does the Centre’s facility offer to residents? Where is the Menno Simons Centre and how do I get there? The Centre is located at the corner of Crown Street and West 11th Avenue, on a slight rise in a quiet, residential area in the Point Grey neighbourhood (near Alma Street and West 10th Avenue). A bus stop is located one block from the Centre and it takes about 10 minutes to take the bus to UBC. Residents can also bike to campus in about 15 minutes. When did the Menno Simons Centre start and who runs it? View our whole history here. Why does the Menno Simons Centre exist? Members of the Pacific Centre for Discipleship Association recognized a need for a Christian residence for college students who attend a wide range of post-secondary institutions in the area. How can I volunteer to help the Menno Simons Centre improve its facilities with ongoing renovations? We are always looking for individuals or groups interested in using their skills to improve the facilities of the Centre. Please contact the office if you have any ideas of when and how you can assist with the ongoing renovations of the Menno Simons Centre’s facility. 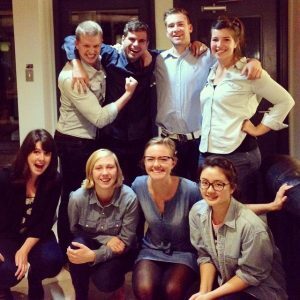 I’m an alumnus — how can I get involved?